Due diligence to protect the company’s proprietary information. Corporations and individuals with confidential information often have a technical counter measures (TSCM) survey conducted to detect unauthorized eavesdropping devises. Traditionally, a TSCM team is dispatched to survey locations for Radio Frequency (RF) transmitters (bugs) that often include the executives’ homes. They typically spend a day or more conducting each RF survey at the various locations. 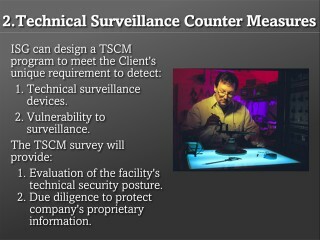 Given the number of locations that require a survey and the limited number of qualified TSCM specialist capable to perform such a survey, the end result is often ineffective as available testing resources mean that the locations are being spot checked at best and may be vulnerable after the survey has been completed. In an ideal world there would be a dedicated TSCM team to constantly survey the RF spectrum in order to identify attacks. However, until now, the practicality of this approach was limited by both budgetary and human resources. ISG can install an RF Cyborg – a RF scanning appliance that provides remote visibility of any change in the RF environment – establishing a persistent presence at each site. When a change is detected, the ISG team is automatically notified and can utilize the centralized appliance to diagnose and address the issue. By deploying the RF Cyborg at your locations you will receive unprecedented visibility into RF attacks. ISG can install the RT Cyborg at your home, office or multi locations and compile information you need 24/7 to meet regulations and most importantly stay secure.